It's my daughter's birthday next week and she wish to have the latest 2gb ipod shuffle. She already has the classic ipod shuffle, i got it as my prize in our company's Christmas raffle three years ago. The new ipod shuffle comes in four vibrant colors and the original silver. The iPod Shuffle Weighs 15.6 grams with a height of 1.07 inches and width of 1.62 inches. 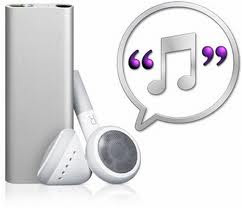 It holds up to 500 songs in 128-Kbps AAC format and Stores data via USB flash drive. With skip-free playback it supports audio formats: AAC (8 to 320 Kbps), Protected AAC (from iTunes Store), MP3 (8 to 320 Kbps), MP3 VBR, Audible (formats 2, 3, and 4), WAV, and AIFF.